Tara Sharp can see auras, and its ruining her life. With only a narcoleptic ex-roadie, her pet galah and a vanilla slice for back up, Tara is ready to take on trouble with a capital T.
Sharp Shooter is an action-packed crime novel with a dash of the paranormal. It’s a quick, fun read that will particularly appeal to Australian readers. The paranormal elements are light, restricted to Tara’s ability to see auras. However, the book carries the feel of urban fantasy. Tara has all the necessary feistiness but is more scruffy than polished. In the beginning, she’s a bit of a mess. She recently lost her job, caught her boyfriend in an affair with her flatmate, and is now broke and living with her parents. She is also struggling with her psychic powers. It turns out that the ability to see auras doesn’t automatically come with the ability to interpret them. I loved that Tara still has to find a mentor and learn. She’s also surprisingly bad at people. Even with her psychic abilities, she misreads intentions. Diplomacy is not her strong suit and she often makes bad decisions. However, while she’s not always the best at respecting other people’s boundaries, she is good at setting her own. This was something I appreciated, particularly during one scene in a limo. Despite being a reasonably fast-paced book, the story doesn’t launch straight into the action. It takes time to establish Tara’s situation and put her through some training. The beginning feels like a bit of a disaster–appropriately so, as Tara reels from one disaster to the next. It verges on disjointed, but never quite crosses the line, and by the end everything has pulled together. I was delighted to discover the story was set in Perth and is filled with Australian idioms and cultural references. For example, the story makes reference to the proper way to eat vanilla slice. I don’t think it would be inaccessible to international readers, but I’m not in a position to make a good judgement on that issue. Likewise, I couldn’t say how faithfully Perth was represented, even though it felt authentic to me. The story respected its setting, rather than using it as vague background colouring. I especially appreciated that, unlike some Australian urban fantasy, the story didn’t feature an overabundance of guns. Readers may want to be warned that the story features a love triangle… and one that so far seems weighted in one direction. However, it was counterbalanced somewhat by Tara’s friendships. She has two childhood friends: one male, one female. It was nice to see a platonic friendship portrayed between the sexes. The female relationships in this book run the gamut from antagonistic to loyal friends, which was nice to see, though I was a little disappointed it tended more towards the former than the latter. Similarly, although the gender balance between the characters was reasonable, virtually none of the women in positions of command. While this may be somewhat reflective of Australian culture, it remains a little bit of a let-down. However, these are mostly just nitpicks. Overall, I enjoyed Sharp Shooter and found it a refreshing piece of Australian crime. 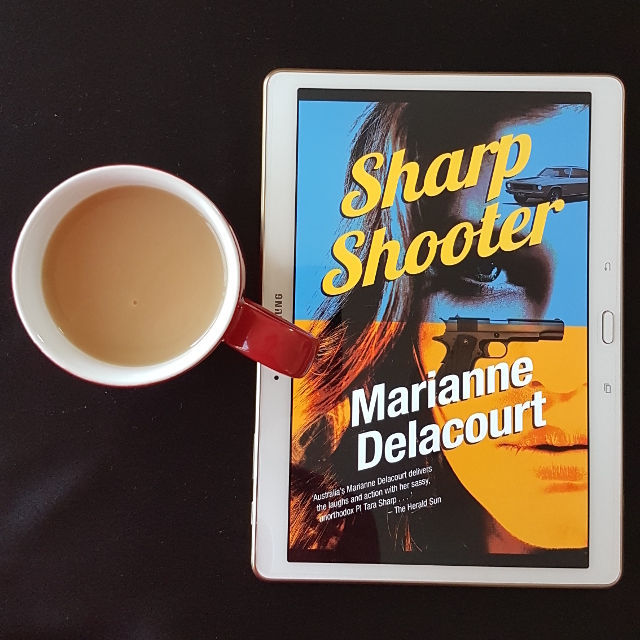 In celebration of the launch of Too Sharp, the third book in the series, Sharp Shooter is available for free across most platforms until 11 April.